Star Wars: Dark Forces is a first-person shooter video game developed and published by LucasArts. It was released in 1995 for MS-DOS and Macintosh, and in 1996 for the PlayStation. The storyline is set in the Star Wars fictional universe and follows the character Kyle Katarn, a mercenary working on behalf of the Rebel Alliance. He discovers the Empire's "Dark Trooper Project", which involves the development of a series of powerful new battle droids and power-armored stormtroopers. 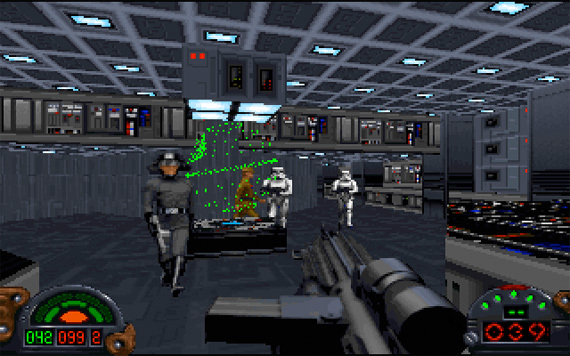 Dark Forces uses the Jedi game engine, which was developed specifically for the game. The engine adds gameplay features to the first-person shooter genre which were uncommon at the time of release, including level designs with multiple floors and the ability to look up and down. Critics gave very favorable reviews to the MS-DOS and Macintosh versions, which were praised for the level design and technological advances. The PlayStation version was criticized for having poor graphics and slow frame rates, reducing playability. A sequel to Dark Forces, Star Wars Jedi Knight: Dark Forces II, followed in 1997. The storyline in Dark Forces follows Kyle Katarn (voiced by Nick Jameson), a mercenary employed by the Rebel Alliance. Before the game begins, Katarn was a student learning the skills required to follow in his father's career of agricultural mechanics. While he was studying at an academy, he was told by officials that Rebels had killed his parents. The pain from this caused him to enlist in the Imperial army. Subsequently, Katarn met Jan Ors (Julie Eccles), a Rebel working undercover as a double agent in the Empire. Ors uncovered the real information about Katarn's parents' death; that the Empire was behind it. The Empire eventually discovered that Ors was working for the Rebels and she was taken prisoner. Katarn helped her escape, thus ending his career with the Empire. He soon became a mercenary and, due to his hatred of the Empire for killing his parents, he began to take on jobs from the Rebel Alliance. Dark Forces begins with Katarn being recruited by the Rebel Alliance to recover the plans to the Death Star, a heavily armed space station capable of destroying an entire planet. The Alliance use the plans to find a weakness in and subsequently destroy the Death Star. One year later, the Alliance hires Katarn again, this time to investigate an assault on one of their bases by a new type of Imperial soldier. His investigation reveals the Imperial Dark Trooper project, led by General Rom Mohc (Jack Angel). His mission to stop the project takes him to the sewers of Anoat City, where he captures Moff Rebus, an Imperial weapons specialist who developed the Dark Trooper weapon. Rebus' interrogation leads Katarn to a weapons research facility in the mountains of Fest and the Gromas mines where minerals are extracted for the Dark Troopers. After learning of Crix Madine's (a former Imperial Commander, who had defected to the Alliance) capture and imminent execution, Kyle proceeds to a high security detention center on Orinackra to rescue him. Madine provides the Rebel Alliance with information about the smuggling of Dark Trooper materials, leading Katarn to investigate the Ramsees Hed docking port on Cal-Seti. He then destroys a robotics facility on the icy planet Anteevy, the second stage of the Dark Trooper production line. After being captured by Jabba the Hutt and having to escape his ship, Katarn infiltrates a computer vault on Coruscant which reveals the location of the Ergo fuel station, the final stage in the smuggling route. He masquerades as a smuggler, gaining access to the Super Star Destroyer Executor, which brings him finally to the Arc Hammer starship, the headquarters of General Mohc's Dark Trooper project, where he successfully destroys the operation and kills Mohc. Music for Star Wars: Dark Forces was mostly original works composed by Clint Bajakian, though they are based on cues from John Williams' original Star Wars works through the utilization of the iMUSE system to create interactive music. The game also features full speech and sound effects in stereo.